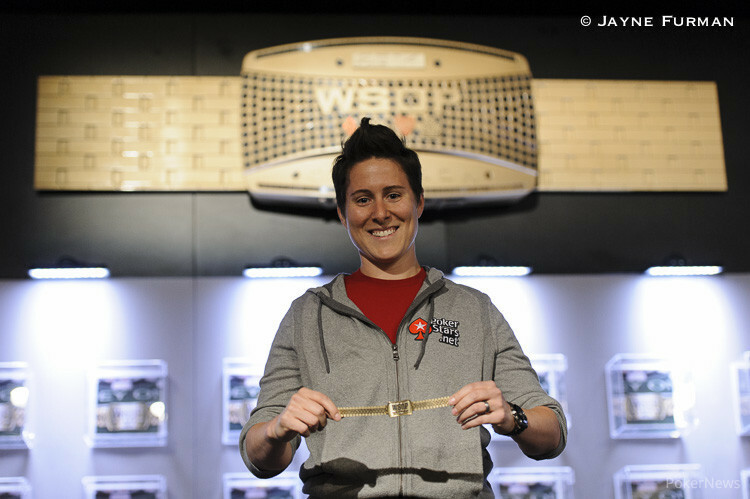 After overcoming a near seven-to-one chip deficit in the semifinals of Event #2: $25,000 Mixed-Max No-Limit Hold’em, Vanessa Selbst overcame yet another big chip disadvantage in the final heads-up match to defeat Jason Mo and capture her third World Series of Poker gold bracelet. The match swung on Hand #63 when Selbst won a massive pot and took the chip lead. The turn was the case queen, giving Mo top pair and Selbst a set of queens, and Selbst called a big bet on the river. Mo doubled shortly thereafter, but was unable to chip up enough to even up the match. Selbst says she benefited from the 20-minute break after the first 52 hands of heads-up play. She was able to watch the live stream for a little bit and prepare to comeback as a five-to-one underdog. Only one woman, Barbara Enright, has as many bracelets as Selbst. The Team PokerStars Pro also has over $10 million in career live tournament earnings thanks to the $871,147 top prize. This was Mo’s second runner-up finish at the WSOP. In 2012 he finished runner-up to Brian Hastings in the $10,000 Heads-Up Championship, earning $229,722. This unique event kicked off on Tuesday with 131 players playing nine-handed poker, and only 60 remained after Day 1 action. On Day 2 all of the tables were six-handed, and they played until the money bubble burst at 16. Phil Ivey and John Juanda exited empty-handed, finishing 18th and 17th respectively. Al Decarolis led the remaining 16 players on the penultimate day, and retained the chip lead entering the heads-up semifinals. Unfortunately for him he was unable to get past Selbst, who as mentioned overcame a near seven-to-one chip disadvantage to advance. In the other semifinal, Mo took on 2013 November Niner JC Tran. The two started their match close in chips, but Mo won a big race and was able to seal the deal. Mo carried the chip lead into the final match, and started to whittle Selbst down. The Team PokerStars Pro was down to as little as 1.68 million, but came roaring back to claim the title. 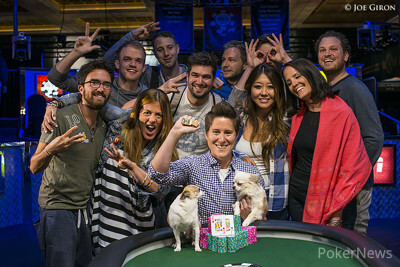 To her delight, not only was Selbst’s wife on the rail, but her puppies were allowed in the Thunderdome as well. Congratulations to Selbst, who will now be a clear contender in the 2014 WSOP Player of the Year race, and made an instant impact in the $25K Fantasy league as well. Be sure to continue sweating our coverage of the entire 2014 World Series of Poker right here on PokerNews, but for now, good night from the Rio! 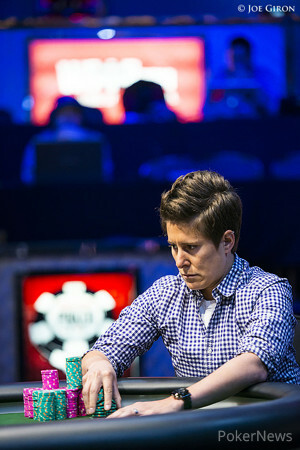 Vanessa Selbst made a big comeback to take out Jason Mo in a heads up match to conclude the $25K Mixed Max at the 2014 WSOP. This is Selbst's third gold bracelet. 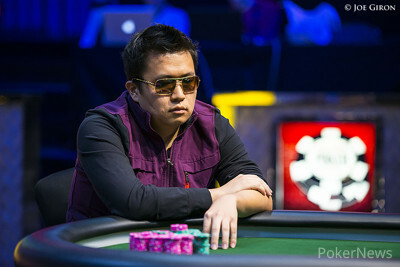 Jason Mo moved all in for 2.535 million on the button, and Vanessa Selbst called. Mo received no help as the board rolled out , and Selbst locked up her third WSOP gold bracelet. Hand #67: Jason Mo received a walk with . Hand #68: Mo raised to 330,000 on the button, Selbst called, and the dealer fanned . Selbst checked, Mo continued for 275,000, and Selbst check-raised to 580,000. Mo folded. Hand #69: Selbst limped in on the button, Mo checked, and the flop fell . The turn was the , the two checked again, and the river was the . Mo checked, Selbst bet 190,000, and Mo folded. Hand #70: Selbst received a walk. Hand #71: Selbst raised to 320,000 on the button, Mo three-bet to 800,000, and Selbst moved all in for effectively 3.355 million. Mo snap-folded. 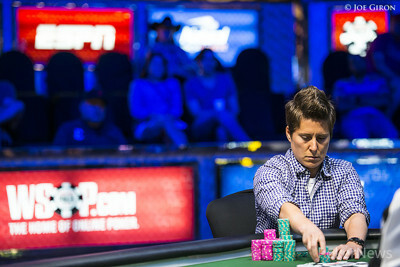 Hand #64: Vanessa Selbst received a walk. Hand #65: Selbst raised to 320,000, Jason Mo called, and the flop fell . Mo checked, Selbst fired out 220,000, and Mo folded. Hand #66: Mo moved all in for 2.07 million on the button, and Selbst called. Mo took the lead on a flop of , and faded Selbst's outs as the turn and river both brought jacks — the and the . He doubled to 4.18 million, while Selbst still has a slight lead with 5.64 million. Hand #61: Vanessa Selbst raised to 250,000, and Jason Mo folded. Hand #62: Mo raised to 275,000, Selbst tanked then reraised to 820,000, and Mo snap-folded. Hand #63: Selbst raised to 250,000 on the button, Mo three-bet to 750,000, and Selbst called. The flop came , Mo checked, and Selbst slid out 580,000. Mo instantly turned his attention to his own stack, reached for chips, and called. The turn was the , Mo quickly knuckled again, and Selbst checked behind. The river was the , Mo led out for 1.315 million, Selbst called, and Mo showed for a pair of queens. Selbst rolled over for a set of queens, and is now at a nearly a three-to-one chip advantage. 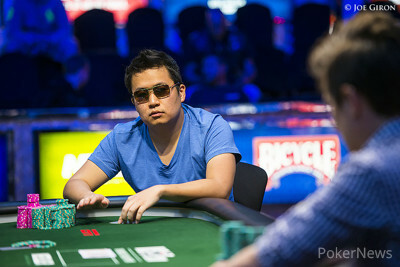 Hand #58: Jason Mo had the button, and raised to 250,000. Vanessa Selbst folded. Hand #59: Selbst limped in on the button, Mo checked, and the flop was . Both players checked. The turn was the , the two checked again, and the river was the . Mo led out for 180,000, and Selbst folded. Hand #60: Mo raised to 250,000 on the button, Selbst three-bet to 680,000, and Mo called. There was nearly 1.4 million in the middle when the dealer fanned a flop of , Selbst led out for 390,000, and Mo folded. 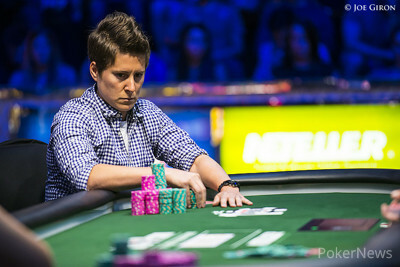 Hand #53: Vanessa Selbst moved all in, and Jason Mo folded. Hand #54: Mo limped in on the button, Selbst checked, and the flop fell . Selbst led out for 120,000, and Mo folded. Hand #55: Selbst limped in on the button, Mo checked, and the dealer fanned . Both players knuckled, the turn was the , and the pair checked again. The river was the , Mo bet 180,000, and Selbst folded. Hand #56: Selbst received a walk. Hand #57: Selbst limped in on the button, Mo moved all in for effectively 1.875 million, and Selbst tank-called. "Seems wide!" someone on Mo's rail shouted. The dealer fanned , giving Selbst top two pair and Mo a diamond flush draw. The turn was red, but the was a brick, as was the on the river and Selbst doubled through. Mo vs. Selbst: Who Will Capture the Bracelet? Hands #15-21: It's a Tran!